Immerse the stone 5 - 10 minutes in water before each use. Always place the stone on a flat, slip-resistant surface. First of all use the coarse grain of the stone for removing small flaws, dents, etc. and to prepare the edge for honing. Pull the edge of the blade in an angle of 15 - 20° across the stone from the heel of the blade to it´s very tip. Use gentle pressure. After some time a fine burr forms. Repeat this same procedure on the other side of the edge. To reach an optimal finish repeat the points 4-5 on the finer stone side. When sharpening at the stone surface forms sharpening mass. The sharpening particles contained in it support a still finer sharpening effect. End the conclusion you tighten the blade with 2 courses each diagonally against the cut on itself. Now also the last burr is distant and the knife has the optimal sharpness. Rinse the whetstone and remove the sharpening mass. In the connection you clean the knives carefully with hot water. 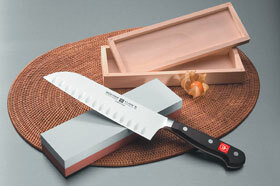 Please use special care when handling the knives. Hold the steel with your left and the knife with your right hand (lefties simply do the opposite) and guide the blade with light pressure across the steel. Do this in an arching motion at a 20 degree angle side-to-side. Repeat this process 6 - 8 times. With practice, you will find this becomes an easy motion. Never stroke each side more than once in succession. That´s all. Now your knife should be as sharp as the first time you used it. By the way, please use a steel which is longer than the knife you hone.